Bannister Lake data and graphics solutions played an integral role at the Gran Turismo European Regional Finals for the FIA GT Sport Championship that were held on October 19-20 at the Feria de Madrid convention center as part of Madrid Games Week. The event is a crucial part of three regional tournaments leading up to the Gran Turismo grand finals which will be held in Monaco next month. As they have in past, event facilitators from Boombox brought in Bannister Lake’s Chameleon data solution to aggregate, moderate and distribute data content to enhance the event for audiences both in-venue and viewers online. The solution was used to read and manage content through Google Sheets, moderate Twitter feeds and handle distribution of data populated graphics. Chameleon’s Blade Restful API was used to reformat data content and make it readily available to Ross Video XPression graphic engines for display. 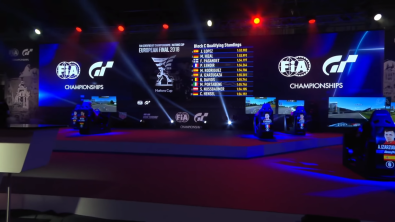 Unlike previous eSports events that utilized databases, the Gran Turismo European Finals relied entirely on the use of Google Sheets for data entry. Google Sheets provides an ideal solution for complex data-driven events when set up time is minimal, and producers want to use a solution known for collaboration that their team is already familiar. The solution provides event organisers with a straightforward way to moderate and standardise data from virtually any source, including game output and in turn bring data into any graphics engine including HTML5 output. Bannister Lake has been active on the eSports circuit facilitating data and graphics solutions at the recent Red Bull Gran Turismo event in Salzburg, Austria, the EA Sports FIFA 18 FUT Champions Cup series held in Barcelona, Manchester and Amsterdam, the Overwatch World Cup Playoffs in Los Angeles and others. The Gran Turismo finals continue with upcoming events in Las Vegas as competitors battle it out for a position at the world championships in Monaco.